The time-dependent radiative transfer equation (RTE), also called a linear transport equation, is an integro-differential equation that is frequently used for modeling transport processes of “particles” (or “wave packages”) through a medium where the trajectories of the particles are affected by random absorption and scattering processes at any location inside the medium. The probabilities that such absorption and scattering events take place at a given location are quantified by two parameters of the RTE, namely the absorption and scattering cross section, which are usually unknown in many practical applications and need to be estimated as space-dependent functions from the same set of measurements or observations. 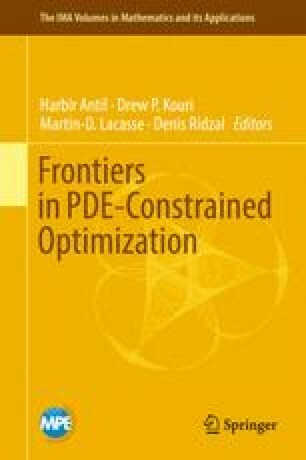 This is the so-called inverse problem or distributed parameter estimation problem for the RTE, which has close links to the field of PDE-constrained optimization. Due to the complex structure and high dimensionality of the RTE, often PDE-approximations to the RTE are employed for obtaining these estimates where however the two distributed parameters of the RTE appear in transformed form. In this contribution we describe some typical practical approaches for solving such distributed parameter estimation problems for the time-dependent RTE including some of its approximations. We highlight some difficulties encountered in the simultaneous reconstruction of two independent distributed parameters from the same data set.